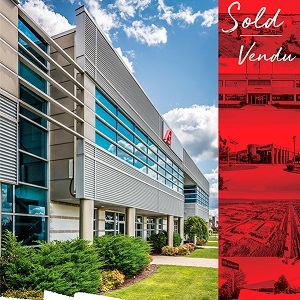 Investors Group Trust Co. has sold the nine-property Investors Group Industrial Portfolio to Fiera Properties in the largest industrial transaction in Montreal in five years. JLL Capital Markets Group issued a release Tuesday announcing the sale of the nine “prime industrial assets,” which together comprise 925,807 square feet. The industrial portfolio was a part of the Investors Real Property Fund, an investment vehicle of Investors Group. Fiera acquired a 100 per cent interest in the properties, according to the release. Financial details weren’t disclosed, but RENX has learned the properties went on the block late in 2017 and generated strong interest among potential buyers. JLL says the properties were built to “high technical standards,” and eight of the properties are located in major sub-markets across the Greater Montreal Area (GMA). One of the sites is located in one of Quebec City’s premier industrial parks. They range in size from 50,000 square feet to 250,000 square feet, are mostly Class A buildings and are a mix of single and multi-tenant properties according to a person with knowledge of the portfolio. “The Portfolio benefits from an outstanding roster of tenants and features a 91 per cent occupancy rate and a WALT of 6.5 years,” the JLL release states. In the release, JLL said the transaction is the largest industrial property sale in the GMA since 2013. Part of the attraction of the portfolio is potential leasing upside in several of the properties. The Montreal industrial market is experiencing a renaissance, with vacancy rates dropping to 4.9 per cent and rents beginning to rise for the first time in several years according to Avison Young’s Q4 Greater Montreal Area industrial report. AY said the Montreal market experienced a net absorption of 1.7 million square feet during 2017. IGM Financial Inc. (IGM-T) is a Canadian personal financial services company. It’s one of the country’s largest managers and distributors of mutual funds and other managed asset products, with more than $150 billion in total assets under management as of Sept. 30, 2017. Its activities are carried out principally through Investors Group, Mackenzie Investments and Investment Planning Counsel. Fiera Properties manages approximately $2 billion of commercial real estate through its investment funds and accounts, which hold office, retail, industrial and multi-family properties across Canada. Fiera Properties is wholly owned by Fiera Capital Corporation (FSZ-T), a multi-product investment-management firm with more than $128 billion of assets under management. Fiera Capital provides Fiera Properties with access to global investment market intelligence.